Kat's Blog: A Really Great Game! I want to tell you about a really great game I just got done playing. It's for the PC. Nancy Drew: Danger By Design. This is the newest Nancy Drew game in HerInteractive's line. It's number 14. Number 15 will be coming out in November. Anyway, a lot of people who played this game have liked it. Some have not. But I personally loved it. The story takes place in France in the heart of the fashion industry. The mystery involves intrigue, espionage and betrayal. You also get to cook with this game which is fun. You get to bake mint chocolate chip cookies and make parfaits. You get to swim through the French catacombs. And you get to take digital pictures which you can print up. You also get to go shopping and really get to barter for items to bring down prices. And if you ever wanted to make masterpiece art, you get your chance to do that too all the while solving a mystery. You, as Nancy Drew, have been hired by a fashion investor to find out why fashion designer Minette, who works out of a moulin, or windmill, has been acting so strangely lately. Throwing tantrums, firing people left and right and suddenly wearing a mask all the time. Could it have something to do with the threatening letters she has been getting? Or could the reason for her odd behaviour stretch further into the past back when France was occupied by Germany during the second world war? It's up to you to unravel the clues. I think this game is fantastic. And the clever thing is, this game is designed for almost all ages really. And if you love mysteries or ever wanted to be Nancy Drew, then these games rock. 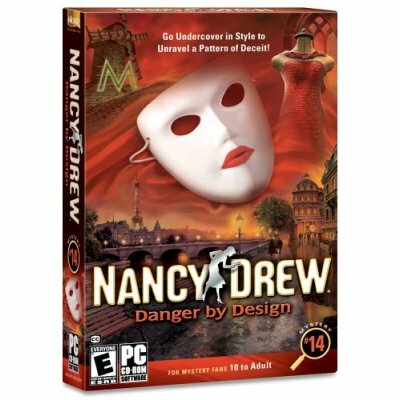 I highly suggest Danger By Design for anyone, but especially for anyone new to Nancy Drew games. The reason for that is this game, unlike the earlier ones comes witha very good and detailed tutorial, so if you haven't played Nancy Drew then this one is a good one to start with. 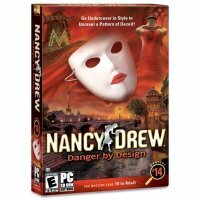 And if you have played Nancy Drew games but not Danger By Design, then I think you'll love it. I did. My favorite part was making cookies and the catacomb swimming. Awesome!